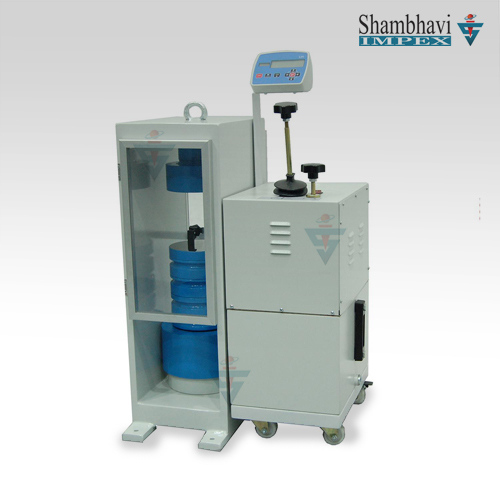 Principal of operation: operation of the machines is by hydraulic transmission of load from the test specimen to separately housed load indicator. The hydraulic system is ideal since it replaces transmission of load through levers and knife edges, which are prone to wear and damage due to shock on rupture of test pieces. Load is applied by a hydro-statically lubricated ram. Main cylinder pressure is transmitted to the cylinder of the pendulum dynamo-meter system housed in the control panel. The cylinder of the dynamo-meter is also of self-lubricating design. The piston of the dynamo-meter is constantly rotated to eliminate friction. The load transmitted to the cylinder of the dynamo-meter is transferred through a lever system to a pendulum. Displacement of the pendulum actuates the rack and pinion mechanism which operates the load indicator pointer and the autographic recorder. 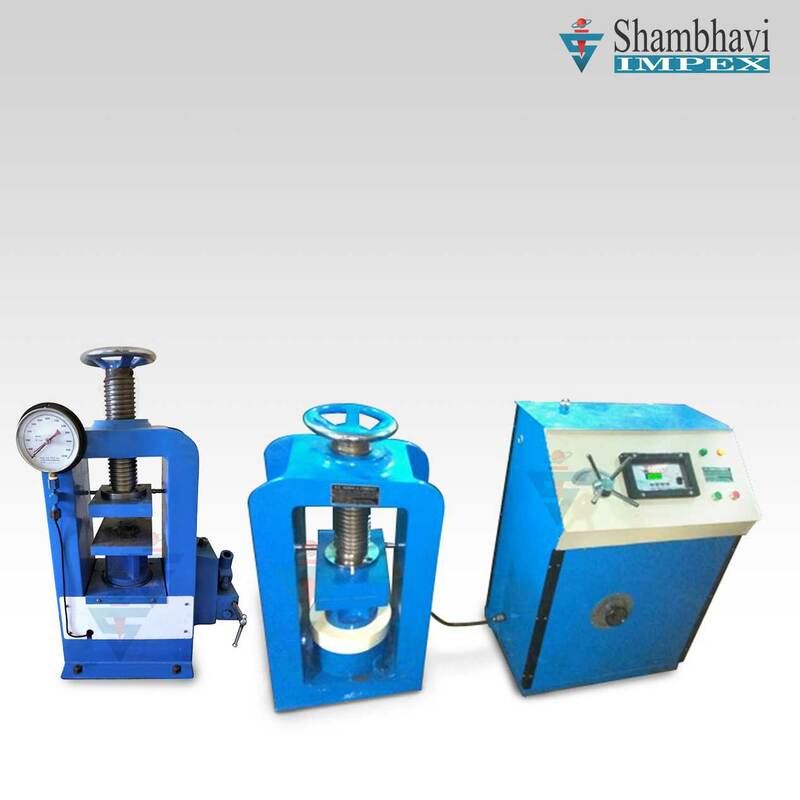 application : fie compression testing machine is designed for test materials under compression bending, transverse and shear loads. Hardness test on metals can also be conducted. 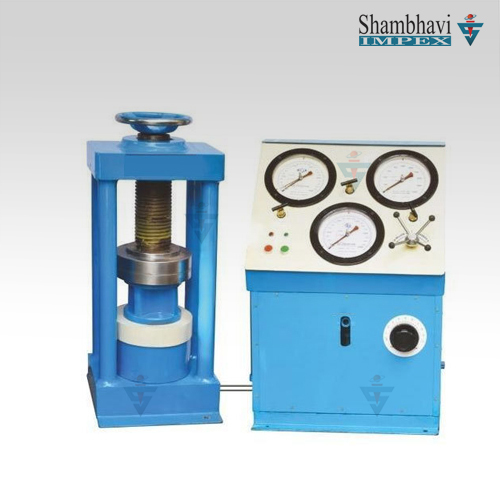 FEATURES :The SI Compression Testing Machine Incorporates design features to enable high accuracy testing with economy, speed & versatility.  Motor driven geared shafts for quick effortless adjustment of cross-head-to facilitate rapid fixing of test specimen.  High reading accuracy due to large size and design of dial. 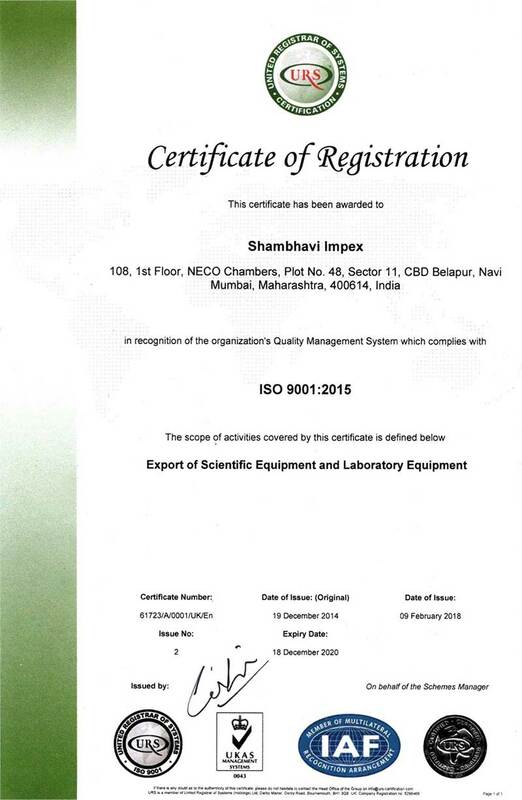  Safe operation ensured be means of safety devices. Control Panel: The control Panel consists of a power pack complete with drive motor and an oil tank, control valves a pendulum dynamometer a load indicator system and an autographic recorder. Power Pack: The power pack generates the maximum pressure of 200 kgf/cm2 the hydraulic pump provides continuously non-pulsating oil flow. Hence the load application is very smooth. Hydraulic Controls: Hand operated wheels are used to control the flow to and from the hydraulic cylinder. 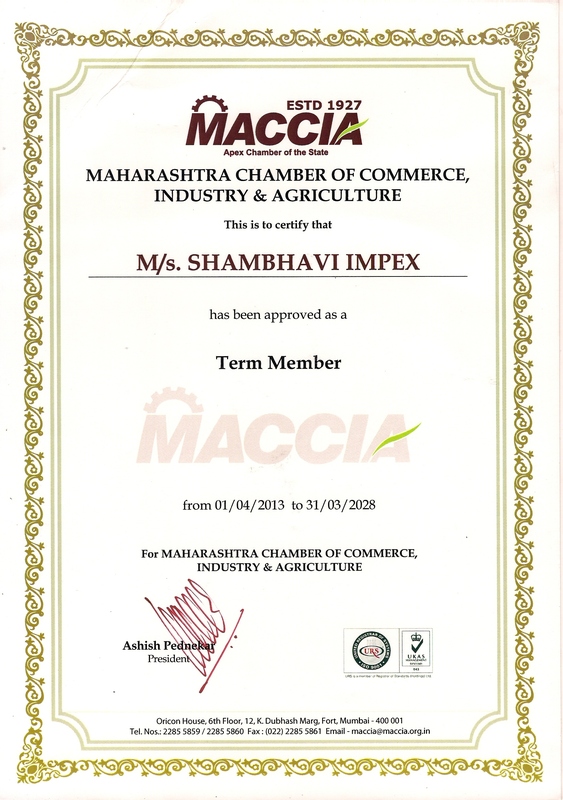 The regulation of oil flow is infinitely variable incorporated in the hydraulic system is a regulating valve which maintains a practically constant rate of table movement. Load Indicator System: This system consists of a large dial and a pointer. A dummy pointer is provided to register the maximum load reached during the test. Different measuring ranges can be selected by operating the range selection knob. An overload trip switch is incorporated which automatically cuts out the pump motor when the load range in use is exceeded. Pendulum Dynamometer: This unit permits selection of favorable hydraulic ratios producing relatively small frictional forces. 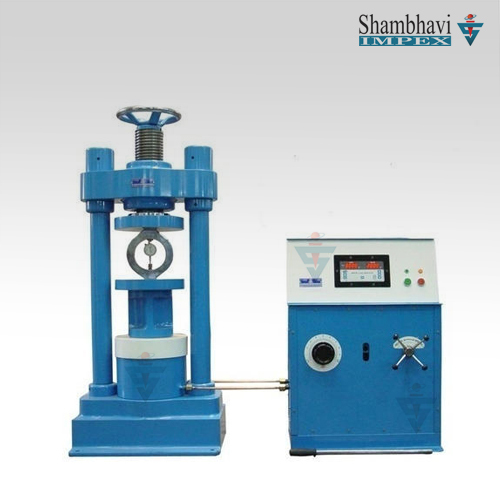 Pressurised oil in the loading cylinder pushes up the measuring piston proportionately and actuates the special dynamometer system. The piston is constantly rotated to eliminate friction. 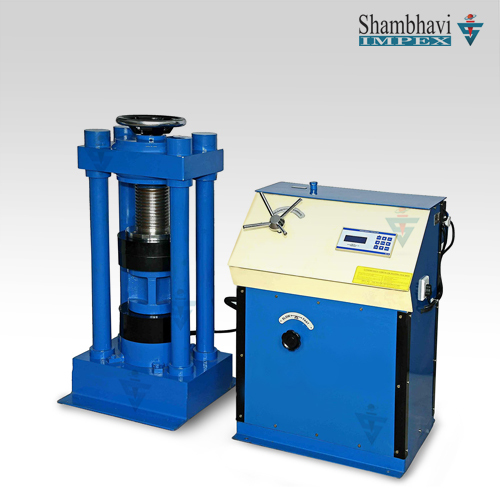 The dynamometer system is also provided with an integral damper and ensures high reliability of operation. The load transmitted to the dynamometer is transferred through a pendulum to the load indicator. Autographic Continuous Roll Load-Elongation Recorder: This unit is of the pen and drum type and is supplied as standard. The horizontal motion of the pen produces the load ordinate of the diagram and the drum rotation produces the extension ordinates in the ration of either 1:5 or 1:10. A continuous roll of graph paper is stored inside the drum and is easily replaced. Accuracy & Calibration:All FIE Compression Testing Machines are closely controlled for sensitivity, accuracy and calibration during every stage of manufacture. Every machine is then calibrated over each of its measuring ranges in accordance with the procedure laid down in BS : 1610 : Part 1 :1992 and IS 1828. An accuracy of + 1.0% is guaranteed from 20% from 20% of the load range selected to full load. Below 20% of the selected range, the maximum permissible error is 0.2% of the full load reading.